The more adventurous things I try, the more I want to experience. Last time I was in the beautiful Arenal area where I went to the colossus volcano and visited the Tabacon Hot Springs. When you travel you get to experience some amazing adventures, some simply seem to happen to you when you head out on the streets and it’s amazing how often Costa Rica offers this happening to tourists. We all like different kinds of adventures, some suit us and some don’t but here is a list of some awesome adventurous activities for everyone that I did on my last part of itinerary. After visiting Arenal my Costa Rica travel agency kindly booked Fonda Vela hotel in Monteverde, this cozy romantic hotel is located only 20 minutes away from Monteverde Cloud Forest Reserve in the middle of the serenity of the forest, where I enjoyed countless eco-toursimus treasures. The lush forests and verdant pastures are excellent for birds and hiking. In this tranquil setting, I saw parrots and emerald toucans that came to feed in the fruiting trees, occasionally. Fonda Vela is certainly one of the most luxuries and warm hotels I ever visited, the restaurant was beautiful and the food delicious. Monteverde offered lots of activities to do like walk guided tour to Monteverde Reserve, this tour included entrance, visit of the Garden of Hummingbirds, also the SelvaturaCanopy and walkways, this Park is a cloud forest conservation project where a wide variety of tours are hosted. 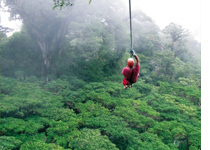 I glided along the zip lines through the cloud forest on the canopy tour and took the treetop walkways consisting of a 1.9 mile trail and eight different bridges that cruise through the forest. The park also had a butterfly garden hosting more than 50 different species of butterflies and a hummingbird garden; I had a great opportunity to take amazing pictures of Costa Rica incredible nature. But the trip just get better, like a pearl at the end of the road; my last stop in Costa Rica was Manuel Antonio beach. The weather in Manuel Antonio is hot, the beaches are surrounded by nature and the breeze... Oh God! Just wonderful! Manuel Antonio also provides lots of tours for visitors like Horseback riding to Tocori Waterfall, Kayaking to Damas Island, Snorkeling, and Canopy among many others. The hotel I stayed at Manuel Antonio was Hotel Costa Verde located on a coastal rainforest bluff overlooking the Pacific beaches of Manuel Antonio National Park. Its many amenities make Costa Verde a perfect destination for those seeking adventure travel, ecotourism, sports fishing or just the tranquility of white sand beaches and magnificent ocean views. Environment and culture obviously go hand in hand in Costa Rica and for travelers wishing for a truly amazing experience, Costa Rica as a destination country is a great idea.